I recently started working with brands on a new blog platform called 'the blogger programme' where you can contact brands and ask to work with them in exchange for products to review etc. I found this online shop through this website, this is not a sponsored post but I saw a lot of items that I liked and would make great, unique gifts! I have already published a post on some gifts I was very kindly sent by After Noah which you can see here. Last orders today and they have a store in London, open late. 1. The Writer Toolbox (£16.99): As a blogger and previously as a university student, I find that I can become subject to writers block which can be incredibly frustrating especially if you have a deadline you need to meet. So when I saw this creative ideas and exercises kit on After Noah I was instantly intrigued. It contains exercises and instructions which help keep those writing juices flowing. I think this would be a great gift for a student or blogger. 2. Pocket IQ Test (£6): I received this myself from After Noah and it is great fun, it would be great for students or brainiacs! I scored 116 as my IQ score which I am not massively impressed with but it is a great little stocking filler - or birthday gift, in my opinion. 3. Kirigami Origami (£6.99): I started creating small basic origami items as a child when a friend of mine started doing it with items from china town in Manchester. I love origami, I think it is a great gift and you can make such cute items. This set is for ages 7+ so I think would would be great for children or teen who like DIY/creating things. 4. Alice in wonderland sticky notes (£6.50): Alice in wonderland is one of my favourite cartoon films - the 1951 version, not the more recent variations! I can't get over how cute these sticky notes are, I need! 5. Freudian Slip Sticky Notes (£6.50): I was kindly sent these sticky notes by After Noah and I do love them. 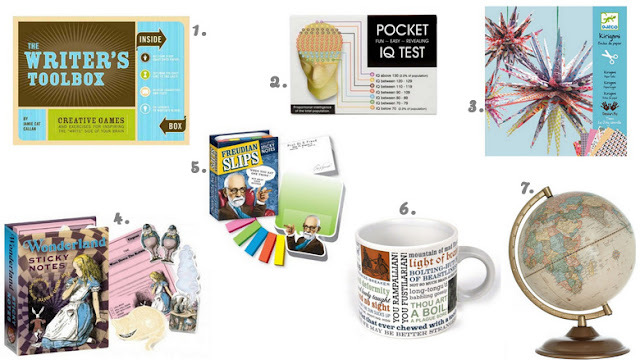 They are so kitsch and perfect for psychology students and enthusiasts! 6. Shakespeare Insults Mug (£10.99): I studied romeo and juliet at school as most children in England do but I personally loved it but others didn't. I think this mug would make a great, cute, funny gift for those who love shakespeare or are studying english. 7. Marian Antique World Globe (£53): All of my gift ideas so far are mostly unisex as I wanted to cover all bases. I have personally always wanted a globe but I have no idea where I would put it. I think this would be a great christmas gift for a traveller or antique collector. 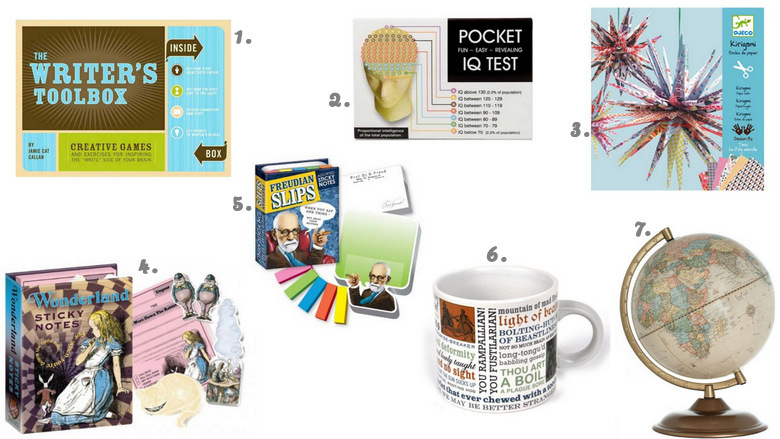 This is so funny- I actually just bought my dad that pocket IQ test!! Love the Shakespeare insults mug! Awesome gift ideas compilation! The Alice in Wonderland stickies are pretty cool. I think these are gifts that most people would certainly enjoy.